Glittering fireworks will be shot from 5 different places simultaneously. The main event ‘Anjin Saikai no Hanabi Taikai’ (Beach Navigated-Fireworks Festival) will deliver you a colorful night sky. Fireworks for the opening of Itō Summer Stage start! Before the fireworks launched, Bon-odori will be held, and there are little fireworks present for the children. After flowing the enchanting lantern, approximately 800 fireworks wil be shoot up. 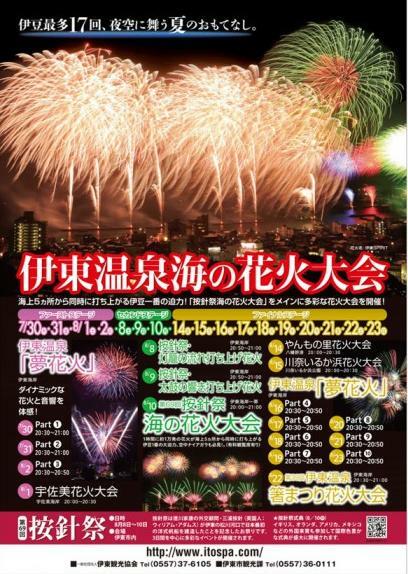 At Nagisa Park energetic taiko (drum) performance will be held and the fireworks will be shoot at the climax. Approximately there will be 10,000 fireworks shoot up in 1 hour from 5 different spot. 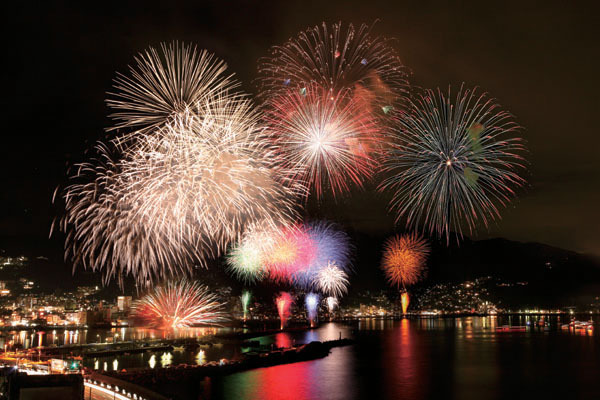 The biggest fireworks festival in Izu! Air Niagara is also a must-see item. 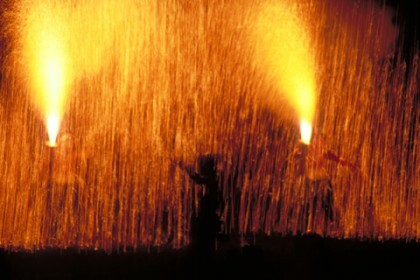 You can book special seat (2,000 seat only, 2,000 JPY per seat), enjoy the fascinating fireworks from the best spot. The festival will begin with ‘Hashi Kuyō’ (Chopsticks Memorial). 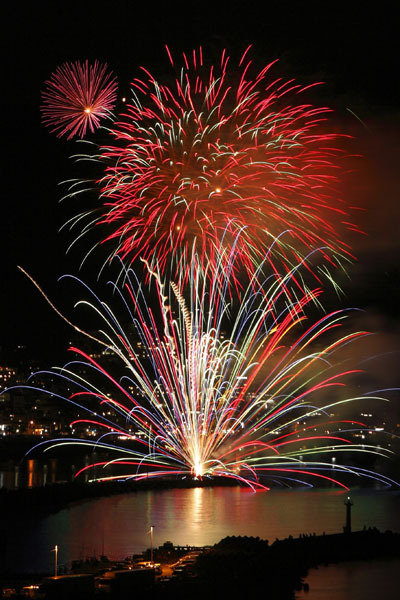 There will be memorial ignition, ceremony, and folk art, followed by around 1,500 fireworks also Tezutsuki (cilyndrical) Fireworks will light up the night. Special seat (2,000 seat only, 2,000 JPY per seat), enjoy the fireworks from the best spot. ※ Please make sure the info you see is the latest in advance.